Thank you for bringing the Waters of your lands. Together we'll make a great medicine of love." 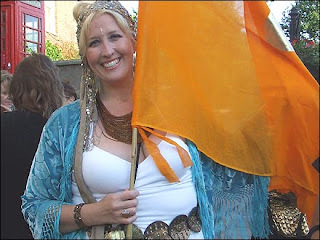 I felt like looking back to my 2011 Pilgrimage to Avalon, to the Sacred Wells, and participation in the Goddess Conference there. I shall never forget that time. The Goddess Conference here at Glastonbury ended yesterday with some beautiful rituals, and I find myself feeling at a loss to write it all, but I'll try. 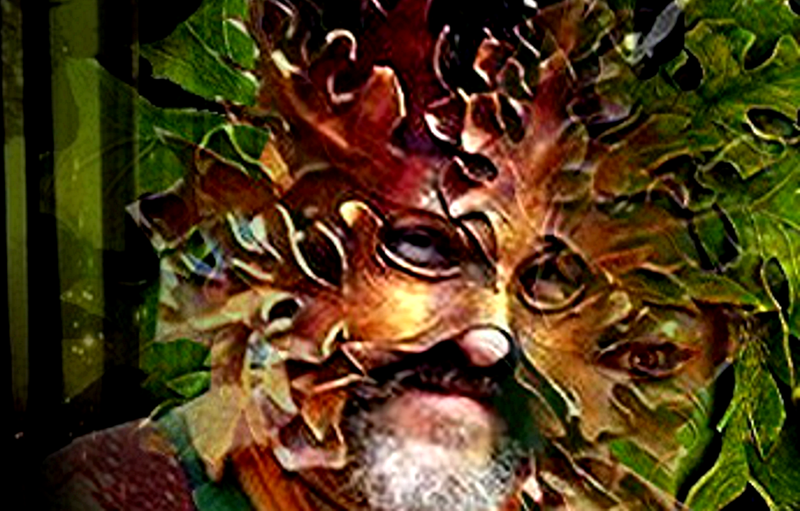 Having done week long ritual cycles in the past, as well as leading a few around the work of the mask, I've experienced the kind of "group mind" or entrainment that happens when one works together in sacred space and "mythic mind". That sounds pretty lame and academic - forgive me. Imagine gathering the first day in groups of people who come from different parts of the world - in my case, from the "west". We have all brought water from our homes, and speaking of this, we pour our water into a vessel, which later will become added to a vessel for all participants. As an opening ceremony, each group approaches the Priestesses of Avalon in a barge, "rowing" to share our waters to the magic isle. This water will be joined with rituals at the "holy wells of Avalon", the Chalice Well and the White Spring. 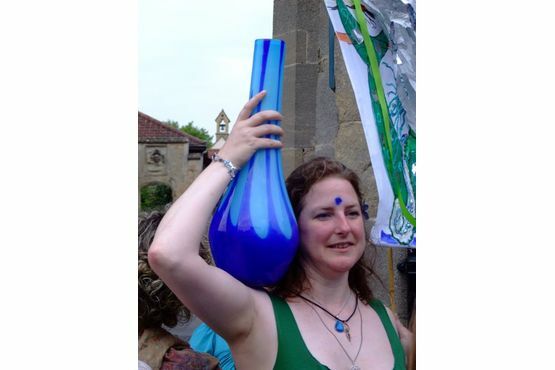 Later small vials of this charged, healing, universal "water of the well, water of the world" are given to each of us to carry back, and we will all make a procession with our banners through the streets of Glastonbury to the river (which once was a great lake, the legendary home of the Lady of the Lake) to pour some of this water into the flowing waters. Quite a wonderful sight, to see so many blue clad, singing women and men gathered waist high in the stream, with our vessels of water, and a woven mermaid! Then a sharing of fruit, to remind all that the Goddess gives to us the fruits of the Earth, always, to share, and to receive. The closing ceremony included a "give away" where all present exchanged gifts. And I leave with my heart open, and my vials of water to share with other waters, and to remember. You know, I honestly feel rather speechless - moved, changed by this experience, the ceremony, the people, the place. The work is about the Goddess, and it is collective, and a field opens that is also deeply personal and transformative. A "mystery". One sees with mythic eyes, with archetypal vision, and waking life becomes a revelation. For example, at the river yesterday, I picked a branch of elderberries, finding them beautiful, and wanting to add them to the "fruits" being shared, but decided it wasn't a good idea. I wasn't even sure they were edible. Some seeing me with them in my hand told me that they were very magical, connected to the Crone and the Goddesses of the underworld. That's why they were called "elderberry". She also said they made medicine from them, and Elderberry wine. I carried those darkly beautiful berries all the way back, thinking as I returned (wet) from the river, and pouring our waters into the worlds waters thus, about my soon to be 62nd birthday. I'll be eligible for early retirement now. I'm entering old age, and I don't know what it means - it's this cycle of my life now. Sometimes, to be honest, I feel very sad and lonely in the midst of it all. 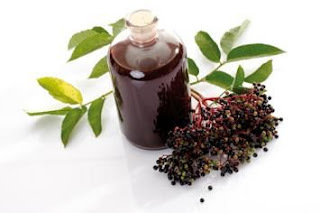 Elderberries, bearing elderberries from the river............... Crone medicine. I was amazed. since I was standing there with the same berries in my hand - so I asked her if I could try it! And so I sat, waiting for the "gifting ceremony", with a nice glass of (like she said, potent stuff!) elderberry wine in my hand, feeling awed, and as if, on top if it all, I had some very magical "medicine" that had just been gifted to me, even before the "gifting ceremony" had begun. Elderberry wine. Healing tonic....... gifts of the crone goddess, potency. It sounds powerful and uplifting!